Super Bowl XLIX viewers last Sunday surely didn’t miss the new trailer for Jurassic World, the newest entry in the franchise that began more than 20 years ago with Jurassic Park. 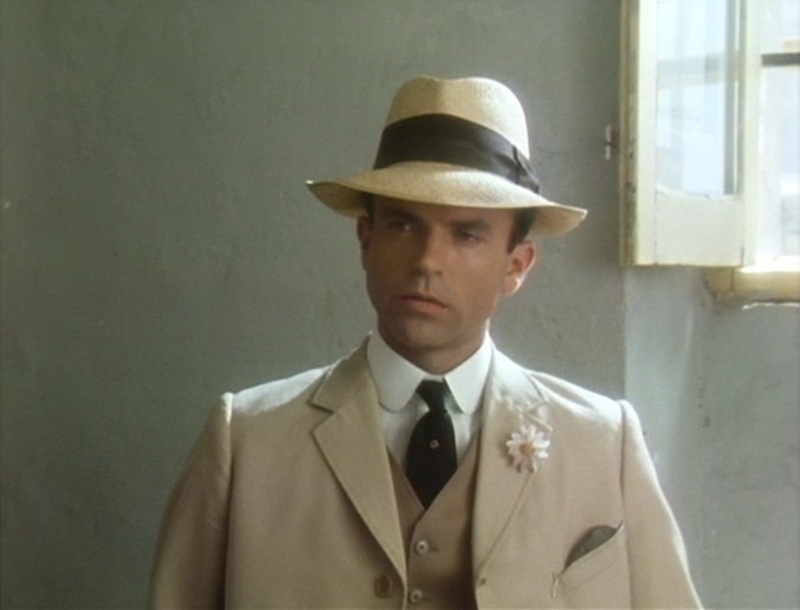 Unfortunately, Sam Neill will not be reprising his role as Dr. Alan Grant in the newest film, so Neill fans itching to fill the void can revisit the brilliant 1983 mini-series Reilly: Ace of Spies. Based on his own highly exaggerated recollections, the series begins with Reilly – ahem, Professor Rosenblum – riding a train through the outskirts of Baku, then a rapidly growing oil town in the Russian Empire. While the real Reilly’s confirmed activity in Baku at the time was dubious at best, the city was certainly essential to “The Great Game”‘s turn-of-the-century players. In fact, Baku’s oil boom led to a rapid population growth between 1856 and 1910 that bested London, Paris, and New York. The series places its hero in Baku for one of his earliest missions, spying on oil fields for the British. 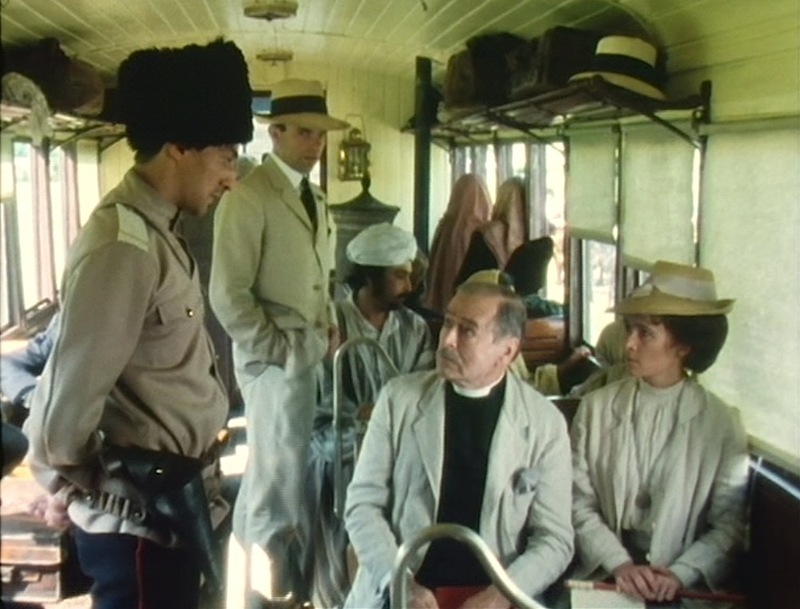 After his train is delayed, he and his fellow passengers – an elderly cleric and his wife – are forced to stay at a nearby “hotel” while he and his possessions are investigated. “An Affair with a Married Woman” deftly weaves together some of the aspects of Reilly’s early life into one thrilling – albeit highly fictionalized – episode. The exact setting of the episode is hard to pin down. The opening titles tell us that this is “1901”, but the meeting in London – supposedly 17 weeks later – is in April 1901, thus placing the Baku scenes around December 1900. Baku enjoys a subtropical climate with cool winters, and the summer clothing worn by Reilly, Margaret, and the others would certainly be too chilly for temperatures around 45°F. It’s most likely that the date on the poster is an error; this scene is likely set closer to midsummer when temperatures in Baku average just shy of 80°F. Reilly stands amongst the train’s other passengers. Note that all appear to be dressed for July rather than December. 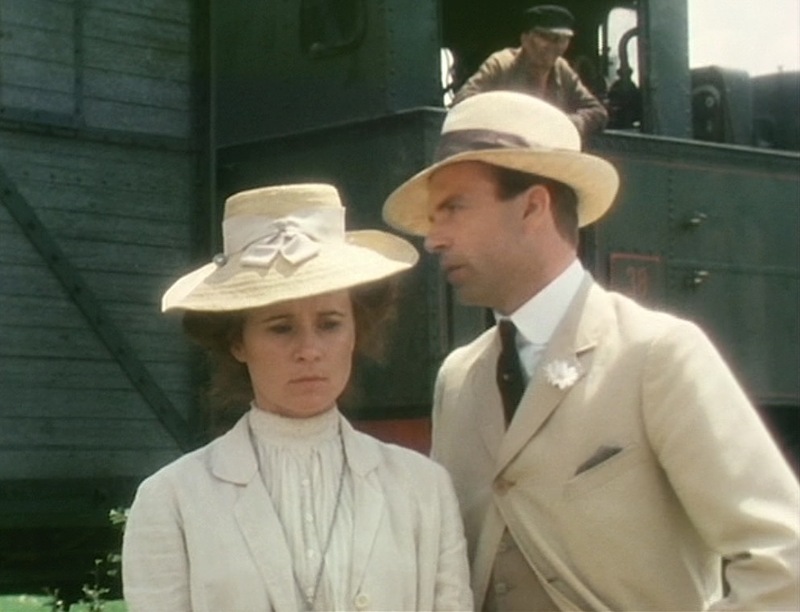 Keeping this in mind, Reilly is nicely attired for a warm summer train ride. His traveling suit is a lightweight cream two-piece lounge suit with a slightly contrasting waistcoat. Reilly’s single-breasted suit jacket has three widely-spaced light brown buttons down the front; he keeps only the top button fastened when he is not sitting. The 3-button cuffs match the buttons on the front. Reilly’s suit jacket has a single rear vent, natural shoulders, and roped sleeveheads. The edge-stitched notch lapels receive a further embellishment with a white daisy pinned through the buttonhole of his left lapel. Reilly takes the cleric’s younger wife into his confidence. The suit jacket’s welted breast pocket slants slightly toward the center, embellished with a taupe pocket square. The hip pockets have large flaps, as does the ticket pocket on the right side. Reilly hides his incriminating documents in his hotel room’s copy of the Quran. The suit’s matching trousers are flat front with on-seam side pockets and plain-hemmed bottoms. We never see them without the waist covered, but they are likely worn with suspenders (or braces, Brits) rather than a belt. Reilly wears a light brown vest (or waistcoat) with the suit. It is a simple garment with no lapels and six buttons down the front to the notched bottom. As usual, he wears his pocket watch in the vest’s lower left pocket with a chain across his waist. 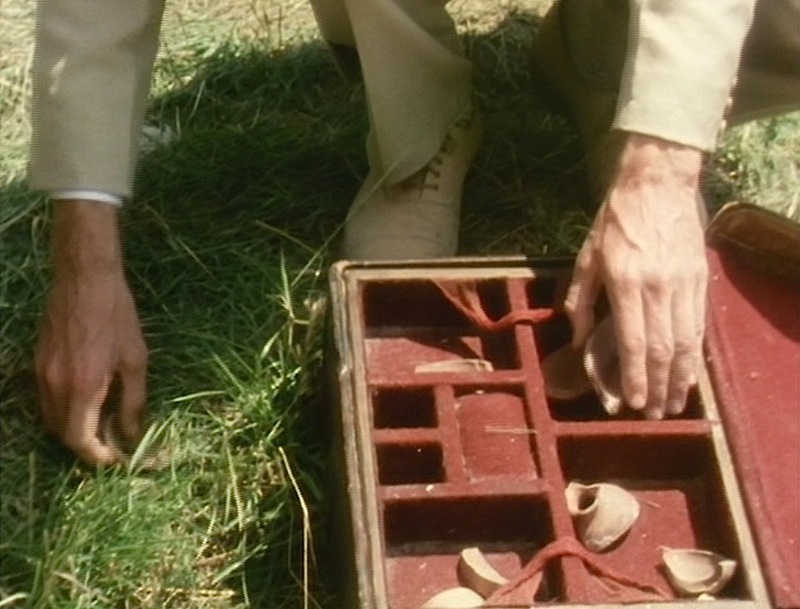 Reilly’s shirt is plain and white with a detachable club collar, fastened onto his neck by a gold collar button. Detachable collars like this were the norm during this era; in fact, shirts with attached collars would not become popular until several decades later. He wears a black silk necktie with a gold stickpin. Reilly checks out his new digs. Reilly’s shoes are a pair of cream sueded leather 5-eyelet cap toe balmorals with cream socks nicely carrying the leg line from trouser to shoe. 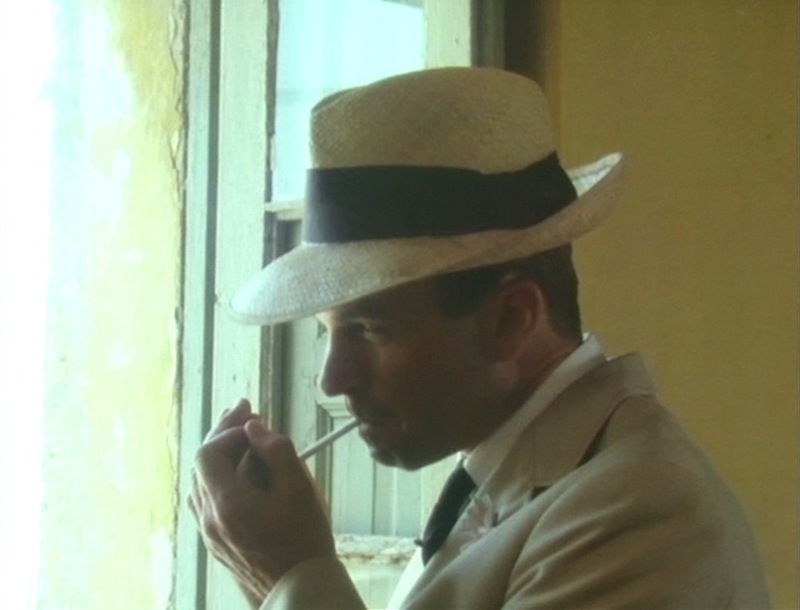 Appropriate for both the setting and context, Reilly completes his outfit with a straw Panama hat. The hat is constructed of light brown straw with a tall crown and wide dark brown ribbon. The brim curls up dramatically in the back. Reilly establishes himself as a debonair force to be reckoned with. 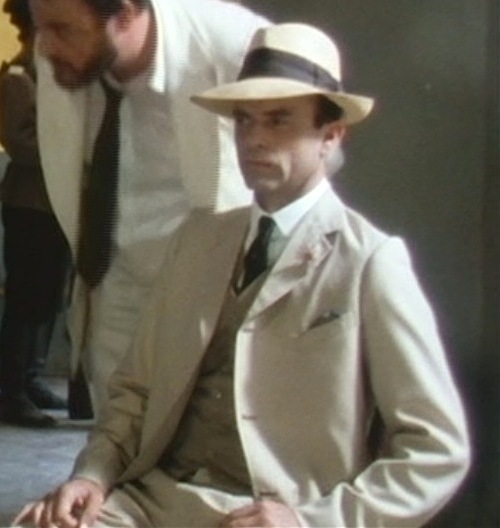 These early scenes are the only appearance of Reilly’s cream suit. 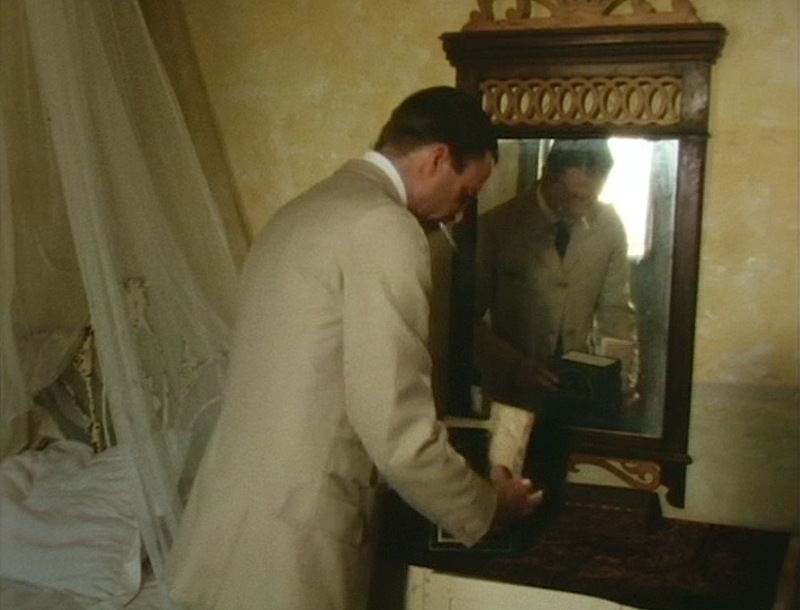 For the duration of his captivity in Baku, Reilly wears a striped light brown suit during the daytime and dresses for the evening in a sharp white tie ensemble that differs slightly from his evening wear ten years later in St. Petersburg. Reilly travels in style, wearing comfortable layers despite the implied heat of the situation. A natty dresser like Reilly pins a daisy through his lapel buttonhole, nicely complementing the earth tones of his suit. This suit is only seen in the first episode, “An Affair with a Married Woman”. At 79 minutes, this clocks in as the longest episode of the series but it’s worth watching and aptly serves as an introduction to both the shrewd Sidney Reilly and the changing nature of espionage in the early 20th century.